बात सन की हैं 2008 , जब फाजिल्का की ऐतिहासिक धरोहर घंटा घर के पास से निकलना मुश्किल था, कयोंकि दुकानदार भाइयों ने उसे पब्लिक टॉयलेट बना रखा था | पहली बार फाजिल्का के कुछ शहरी आगे आये, बजरंग गुप्ता जी ने नगर कौंसिल का सहयोग दिलवाया और घंटा घर की सफाई कर हवन करवाया गया था | सरहद केसरी परिवार , ग्रेजुएट्स वेलफेयर एसोसिएशन, अमृत सचदेवा , आर्य समाज, सेवा भारती आदि सामाजिक संस्थाए और चंदर रेस्टोरेंट , हरमीत वाच कंपनी , नागपाल बूट हाउस, अदि कुछ घंटाघर की मार्किट के दुकानदार साथ आये | ज़्यादातर दुकानदार विरोध में की अब हम मूत्र विसर्जन कहां करेंगे | इतनी बड़ी दुकाने , कुछ एक कब्ज़े पर भी, पर मूत्र विसर्जन के लिए ऐतिहासिक धरोहर घंटा घर | पहली बार फाजिल्का विरासत महोत्सव के समय घंटाघर को सफाई करवा कर सजाया गया | अनिल सेठी नगर कौंसिल प्रधान बने और इसके बाद इसके काया कल्प की जिम्मेदारी उठाई गयी और आज वही घंटा घर शान फाजिल्का की | जिसपर फाजिल्का ज़िले का आंदोलन हुआ | जब धरोहर को बचाना था तब कहां था व्यापार मंडल और उनके सदस्य ? दुकानदार रेहड़ी खड़ी करने के एवज में रोजाना 200 से 300 रुपए लेते हैं , कौनसा नियम कानून यह कहता हैं | अगर गरीब रेहड़ी वाला रोटी खा लेगा तो क्या | नगर निगम की सड़क और पैसे ले दुकानदार | इस गैर कानूनी काम पर कयों नहीं बोला व्यापार मंडल कभी ? पैदल चलने की जगह कब्जे करे आपके दुकानदार , घंटाघर पर शौचालय बनाकर मूत्र विसर्जन करे आपके सदस्य , सड़क पर कूड़ा फेंके आपके सदस्य, पेड़ काटे आपके सदस्य तब फाजिल्का व्यापार मंडल कहीं इसका बहिष्कार करते नहीं दिखा ? The office of the traffic adviser (Punjab) has conducted a study on the reason behind accidents in Mohali and has identified 21 accident-prone spots. 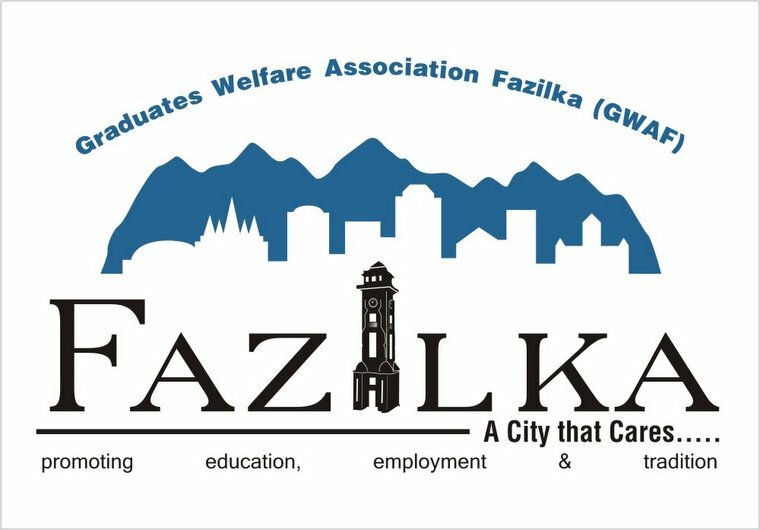 The death zones are Phase 8 industrial area towards Radha Swami chowk, Phase 7 industrial area towards Spice Chowk, Phase 6 new bus stand towards Balongi barrier, Phase 35 light point, Landran and Saneta Road and SohanaLakhnaur Road. The traffic advisor, Navdeep Asija, and his student Abhishek Bajaj conducted the study, which showed an increase in accidents. The number of pedestrians and cyclists killed in mishaps shot from 38% in 2013 to 56% in 2015, the study revealed. As many as 16 accidents happened between 9pm and noon between 2013 and 2015.During midnight to 3 am, 12 people died between 2013 and 2015 in road mishaps, the study said. 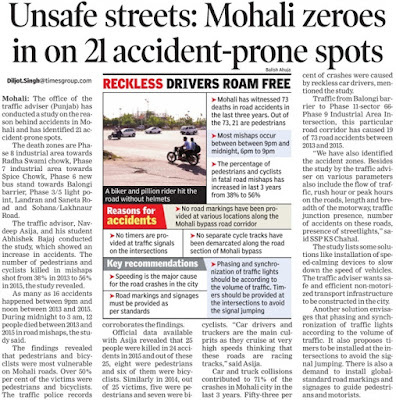 The findings revealed that pedestrians and bicyclists were most vulnerable on Mohali roads. Over 50% percent of the victims were pedestrians and bicyclists.The traffic police records corroborate the findings. Official data available with Asija revealed that 25 people were killed in 24 accidents in 2015 and out of these 25, eight were pedestrians and six of them were bicyclists. Similarly in 2014, out of 25 victims, five were pedestrians and seven were bicyclists. "Car drivers and truckers are the main culprits as they cruise at very high speeds thinking that these roads are racing tracks," said Asija. Car and truck collisions contributed to 71% of the crashes in Mohali city in the last 3 years. Fifty-three percent of crashes were caused by reckless car drivers, mentioned the study. Traffic from Balongi barrier to Phase 11-sector 66Phase 9 Industrial Area Intersection, this particular road corridor has caused 19 of 73 road accidents between 2013 and 2015. "We have also identified the accident zones. Besides the study by the traffic adviser on various parameters also include the flow of traffic, rush hour or peak hours on the roads, length and breadth of the motorway, traffic junction presence, number of accidents on these roads, the presence of streetlights," said SSP KS Chahal. The study lists some solutions like installation of speed-calming devices to slow down the speed of vehicles.The traffic adviser wants safe and efficient non-motorized transport infrastructure to be constructed in the city. Another solution envisages that phasing and synchronization of traffic lights according to the volume of traffic. It also proposes timers to be installed at the intersections to avoid the signal jumping. There is also a demand to install global standard road markings and signages to guide pedestrians and motorists.